A FEW WEEKS AGO I was in Pinehurst, North Carolina, for a national amateur event hosted by RSM McGladrey and the PGA of America. I spent some time with Natalie Gulbis, Chris DiMarco and Zach Johnson (story to come). I also had the opportunity to visit with Donald Ross, the legendary golf course designer who was a mainstay at Pinehurst. Ross designed four Pinehurst courses, as well as Seminole in Florida, Oak Hill in New York, and Oakland Hills in Michigan. Actually, Ross died in 1948, so I talked to his famous statue, who stands near the entrance of the Walk of Fame at Pinehurst No. 2. I confess that it didn’t go very well. Most of my questions just hung in the air, and the following transcript doesn’t convey the long, uncomfortable pauses between questions. At one point I lost my cool. For that, I apologize. Q. Thanks for taking the time. It’s an honor to speak with you. Q. What do you think about golf returning to the Olympics? Q. Did you ever think you’d see golf became a worldwide sport? Q. Do you have any thoughts on the grooves change? Q. Equipment sure has changed since back in the day (chuckling). Q. How do you get along with the Payne Stewart statue? Q. Are there any generational issues, or is your common interest in golf a bonding thing? Q: Pete Dye said your mother wore army boots. Q. Sorry. Actually, Pete didn’t say that at all. That was totally uncalled for. Q: OK, one final question. Of the 600 golf courses you designed or redesigned, which one do you consider to be your masterpiece? 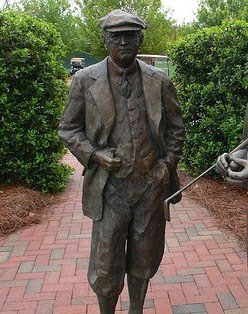 DONALD ROSS STATUE: Pinehurst No. 2. The concept of this post is brilliant. Absolutely hilarious. That Donald Ross Statue is a jerk for being so stand-off-ish. But at least he didn't turn his back to you. Love the originality of your posts...great! Thanks For Sharing "Donald J. Ross Statue at Pinehurst" he was the one of the most significant golf course designers in the history of the sport. He was born at Dornoch in Scotland, but spent most of his adult life in the United States. What I say about this post. This is a Brilliant post. Great article. Each of your questions had me on the edge of my seat as I awaited the insightful responses! :) Thanks for the return trip to The McGladrey Team Championship. You might have been able to confirm your "dog in the bushes" suspicion with one more question. Mr Ross - what do you consider to be your greatest contribution to golf architecture ? If the answer came back "ROUGH", you would've had confirmation. I always love finishing up on 18 and looking over to see that statue. He really did have an eye for course design and now that Pinehurst #2 is restored back to its original layout, the 2014 U.S. Open is shaping up to be a phenomenal tournament.